I hardly ever follow a recipe exactly. (I just don't have the attention span.) However, I constantly gather ideas from cookbooks and magazines. I found this great little magazine at the supermarket called La Cucina Italiana. The photos are beautiful, and it drew me in with an in-depth article about porcini mushrooms and and another on panini sandwiches. Anyway, I ended up making one of the wonderful panini sandwiches after returning home from the farmer's market on Saturday. The recipe happens to be online HERE. 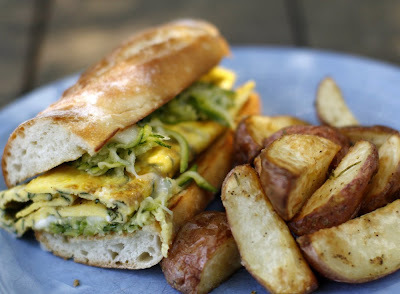 I used nearly all local ingredients: Paul & Angela's eggs, Sherry's wonderful baguette, Whitton Farms' new potatoes, zucchini, and Gracious Garden's sweet basil. What did I do differently? I grilled the inside of the bread in olive oil for extra crispness, I did not grill the cheese, and I used mozz instead of whatever hard-to-find cheese they suggest. I served it with roasted rosemary new potatoes. This is way too complicated to do every day. I mean, I babied these things to death to get them the way I wanted them. They were delicious and worth the time, but I fumbled through the process so much I'm not even sure I can tell you what I did. I'm just figuring it out, so it'll get easier. Right now they're sauteed, boiled, baked, and then grilled. Whew! Really, I'm not kidding. This recipe makes about 14 dogs. All aromatics are pulsed in a food processor until very finely chopped but not mush. They they are sauteed until the onion is translucent. Do the same with the potato and mushrooms but add the boullion cubes. Mix that and all remaining ingredients in a large bowl. At this point, you could make burgers or meatballs or sausages. 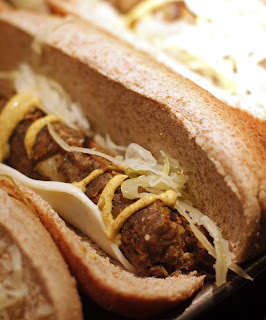 To form sausages, lay a 1/2-inch mound of the mixture across a piece of foil leaving a 1/2-inch margin on either end. Roll it tight like a sushi roll, and twist the ends shut. Find the middle of the large roll and twist it forming two smaller links. Repeat. Boil all links in a large pot for 20 minutes. This will activate the wheat gluten and help them stay together. Once the sausages have cooled, remove them from the foil and place them on a large baking sheet. Stick them on a 250 degree oven for one hour to dry out. Now when you are ready to eat, all you need to do is grill 'em. At the OSOME gathering as we went around the table to tell what we made for everyone, Andria proclaimed that it is not a contest to see who can use the most local ingredients. "Too bad," I said jokingly, "because I would have won." The onion, garlic, shittake mushrooms, and new potatoes were all local. So there! 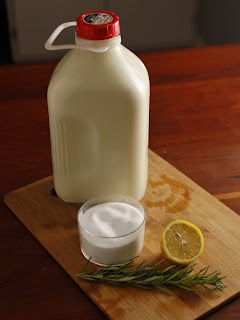 Pour the milk into a large pot and set it on the stove, and add the sprigs of rosemary. Set the eye on very low. You want to slowly bring the milk up around room temperature. Add a pinch of salt and set the eye on high. At this point you want to bring the milk to a boil. Stir it to ensure that the milk does not scorch. Once you achieve a nice rolling, frothy boil hit it with the lemon juice. You will be amazed. The curds grab on to one another. You will see the milk separate into the whey, a yellowy liquid, and the curds, solid white chunks. Let the mixture sit for about 10 minutes to cool and to make certain that all of the curds have gathered up. Remove the rosemary. Line a strainer with cheesecloth and pour the mixture through. 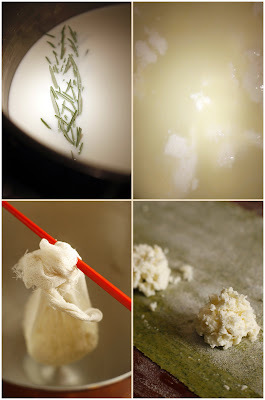 Tie the cheesecloth over a chopstick and hang the cheese suspended inside of a large bowl. This will allow it to drain. After one hour in the fridge cut open the cheesecloth and place your cheese in an airtight container. It will keep about 5-7 days in the fridge. I used mine to stuff some ravioli. I made green dough by blanching some arugula, squeezing it dry and blending it with my dry flour. I then added three egg yolks and proceeded as normal. The sauce is simply a head of roasted garlic mixed with olive oil and one diced tomato. It was wonderful. Oyster mushrooms? Lobster mushrooms? Look around and you will discover that when people describe mushrooms they often use the flavor of seafood as a frame of reference. Why, you ask? Well, mushrooms and seafood actually share many of the same flavors and textures with one another. That makes many mushrooms great to use in place of seafood in many dishes. One of my favorite mushrooms is the king oyster. It is really a weird little guy. A good sized king oyster will be about 5 inches long and about as big around as a peeled banana. The flesh is white, and it has a diminutive cap. Unlike most mushrooms, it's prized for its stem but not its cap. The flavor is mild, and the texture is chewy and meaty. The first time I ever had one, I thought I had been given meat. No joke. As a nice bonus, they pick up and display the flavors in a marinade very nicely. Slice them into rounds to simulate scallops, or slice them longways to use like little fish filets. Everything but the chili powder goes into an airtight plastic container. Add enough water to cover, and refrigerate at least 3 hours or overnight. Remove from marinade and towel off. Sprinkle with a good-quality chili powder. Grill over a hot fire for about 2 minutes per side. 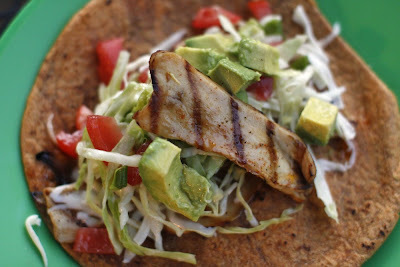 Serve with warm tortillas, sour cream, shredded cheese, cilantro, diced tomatoes, and avocados. 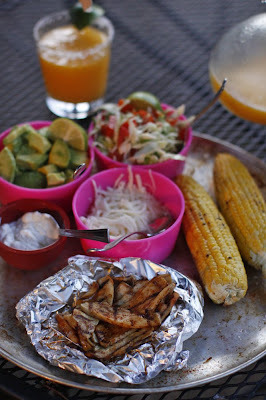 Round out the meal with grilled corn and frozen mango margaritas. Ole'! There are some big, big flavors in this little sandwich. 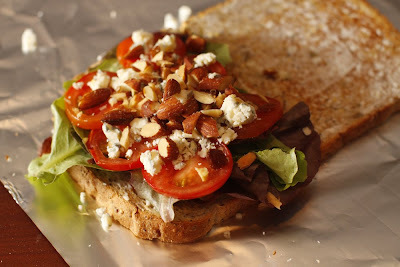 The smoked almonds are a great stand in for bacon in my version of the classic BLT. 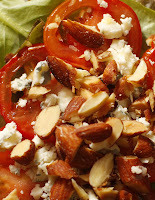 I"m starting to use smoked almonds in place of the over-processed fake bacon products. They are healthier and more delicious. This sandwich gets an extra boost with a few crumbles of blue cheese. It is the thing that makes this sandwich a real standout. I won't bore you with instructions on how to assemble a sandwich, but I do have one quick tip for you. When using tomatoes on a sandwich you are not going to eat immediately, you should first leach some of the moisture out of the tomato so your bread doesn't get soggy. Do this by slicing and salting the tomatoes, allowing them to sit for a few minutes, and toweling them off. This will remove enough of the moisture to prevent soggy sandwich syndrome. 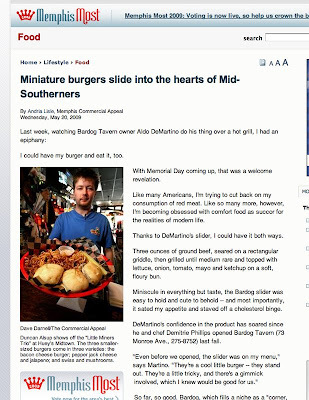 I was happy to be the lone vegetarian voice in a story about little hamburgers that appeared in the pages of our daily paper, The Commercial Appeal. Don't give up trying to find me. I'm near the end of the story, because I like to get the last word. Click HERE to read it. Pulse celery, bell pepper and onion in food processor until finely chopped. Set aside. Boil water in medium saucepan and add bouillon and garlic. Slowly add grits while stirring liquid. Reduce heat to a simmer and cook grits, covered, for 40 minutes. Set aside to cool. Sauté chopped celery, bell pepper and onion in olive oil over medium-high heat, until onion is translucent and all of the liquid has evaporated. Add sautéed vegetables, spinach, kidney beans, and hot sauce to grits. Stir to incorporate. Cover and refrigerate for 2 hours. Portion into 12 patties, and brown in non-stick skillet with olive oil. To make remoulade, place all ingredients in a food processor and blend until smooth. Serve on baguette slices with remoulade sauce (recipe follows), heirloom tomatoes and iceberg lettuce. I often buy things at the market that I have never tried. 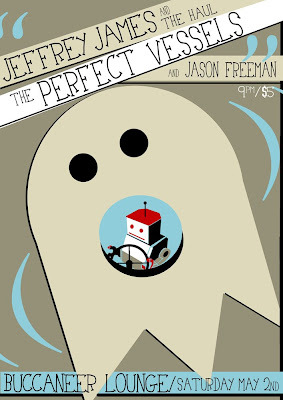 Sometimes what I picked up turns out to be good, and sometimes it is just not to my liking. On a recent trip to the Viet Hoa Market I walked out with a banana flower, long beans, and quail eggs. I love the long beans and the quail eggs, but the banana flower is not something I'd put in the basket again. I wanted to love it because it is so pretty, but that somehow was not enough. I read all about them before I cut into it. You can use them in soups, curries, and salads. So I decided to try it raw to get the full flavor. It tastes like those bitter bits of string that live between the banana and the peel. You know what I'm talking about. So until someone changes my mind, banana flower goes on the bad list. 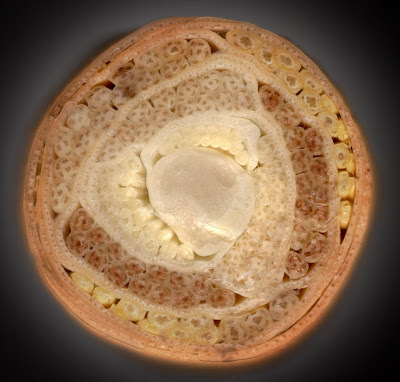 BTW that is a scan of a banana flower that has been cut in half. I told everyone that I was bringing pizza. I had this dough in my fridge that I had let rise for 3 days and I believed that it was ready to be made into pizza. It was a mess. I can make pizza in my sleep, so I'm not really sure what went wrong. It was sticky and flat. So it is now 10 past 6 and I'm supposed to be at the OSOME gathering at 7ish. What do you do? 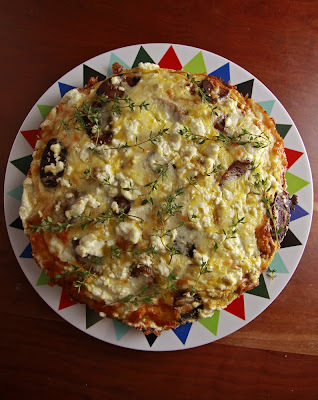 Frittata, that is what. 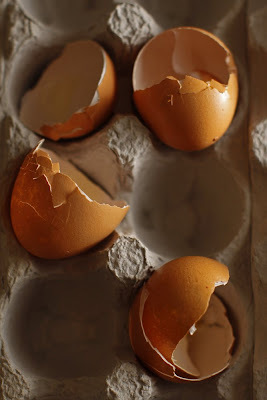 I had the pizza topping already prepared, and I had gotten some eggs from a friend earlier in the day. I used some select pizza toppings to fill and top the frittata. It was some unplanned local deliciousness. Preheat your oven to 375 degrees. Mix the onion, eggs and bread together in a large bowl. Oil a large non-stick skillet and place over medium heat. Arrange the potatoes in a single layer. Pour egg mixture over potatoes and top with sausage. Cover and cook until the edge starts to set. Place into the hot oven for 10 minutes. Remove cover and add cheese. Cook until the center is not jiggly and the cheese is golden. Top with fresh thyme. 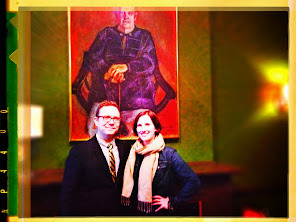 A big thanks to Andria for hosting again this week. In addition to the frittata we had a wonderful tofu stir fry, caprese salad, guac, asparagus pie, and for dessert strawberry ice cream. To read more about our local food adventures click HERE. Mix the flour, salt, and oil in a bowl. Add half the water and mix. Add the other half of the water and mix again. (You want a slightly stiff dough like a pie crust.) Wrap dough ball in plastic and stick it in the fridge for 30 minutes. Over medium-high heat, drizzle a few tablespoons of olive oil in a nonstick pan. Put the potatoes in a single layer, and do not disturb them for 4 minutes. (This is the secret to crisp potatoes.) Stir; layer again. Add the crumbled sausage and paprika and allow the sausage to brown. Add the onion; cook until translucent. Remove from heat, transfer to a bowl, and toss in the hot peppers. Allow mixture to cool enough to handle. Preheat oven to 400 degrees. Divide the dough in half and roll it out until it is about 1/8 to 1/16-inch thick. Use a cup to cut rounds out of the dough and stack them off to the side with a little flour in between each one so they don’t stick together. Grab one dough round and place it in the palm of your hand. Pick up a pinch of the filling and stuff it into the center of the dough round. Next, fold it like a taco, pinch the edges together, and set it on your work surface. Using a fork, seal the edge. Repeat until all of the dough has been used. This should make about a dozen. Bake on a silpat-lined baking sheet for 25 minutes. 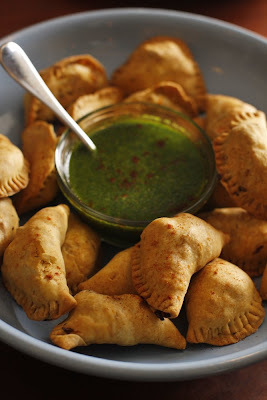 While these are in the oven, make the chimichuri sauce. Into a food processor place the leaves from a bunch of parsley, the garlic, lemon juice, and three tablespoons or so of olive oil, salt, and pepper. Blend until it is a sauce. If it is too acidic, add some sugar. The salad is simple, but the presentation is elegant. 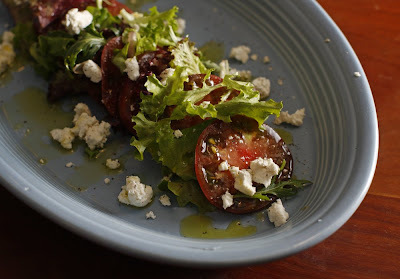 Layer sliced heirloom tomatoes and local lettuce on a large plate. Drizzle with olive oil, 10 year old balsamic vinegar, and crumble goat cheese over the top. Season with salt and pepper and you are ready to eat. I could not help myself. It looked so delicious that I just dug right in without thinking: spicy shrimp, fried eel, and even pork chitterlings with onions and greens. What would cause someone like me who has been a vegetarian for over twenty years do such a thing? It was all faux. Buddha's birthday was on Sunday and my friend Tea' invited me to a celebration at the East Memphis Buddhist Temple. She told me that the feast is all vegetarian and that they go all out. Unfortunately that was the day I did the triathlon, so I could not make it. However, she did not forget about me. Monday she called and asked me to come by and pick up some leftovers from the feast. I left with enough food to have my own Buddha's birthday feast, so that is what we did. I called up my good friends Michael and Kelly and told them to put a big pot of rice on to boil. I showed up a few minutes later with the bounty of food and a growler of pale ale. We enjoyed the wonderful meal outside at the farm table that lives in their back yard. I have had some great meals at that table and this ranks up there with the best of them. 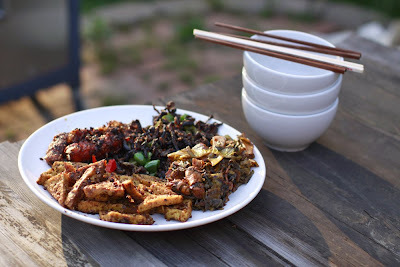 The eel was made from dried mushrooms, The chitterlings were wheat gluten, and the spicy shrimp was fashioned from chopped tofu and rice paper skins. We marveled at the craft and attention to detail. Tea' will be opening her own restaurant soon called New Que Huong at 942 West Poplar Ave in Collierville. She will be serving traditional Vietnamese cuisine including some very delicious vegetarian offerings. She plans on opening in about three weeks, and I plan on being the 1st one through the door. 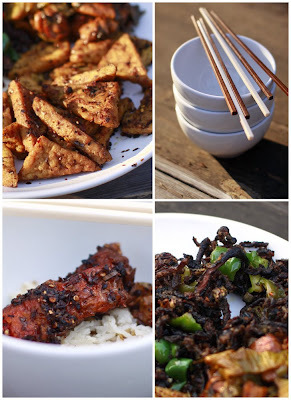 I just wanted to say hi and thanks for joining the chubby vegetarian blog. 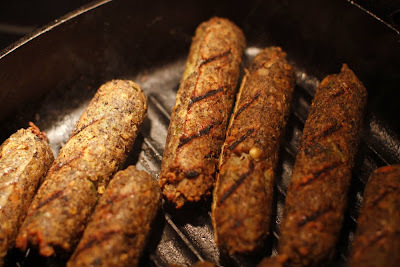 You can access the site easily at www.thechubbyvegetarian.com. Expect to see an average of three posts a week most of which are accompanied by a recipe or two. I love to spend time in my kitchen and hope that my enthusiasm is infectious. After 13 weeks of training, 7 weeks without a beer, hundreds of dollars in gear, and a lot of hard work I am participating in the Memphis in May triathlon tomorrow. I'm nervous, but ready for the .9 mile swim, 25 mile bike, and the 10k run. Say a prayer for me. I did it. Yeah! I wanted to finish in under 3.5 hours, and I did. My official time was 3 hours and 24 minutes. 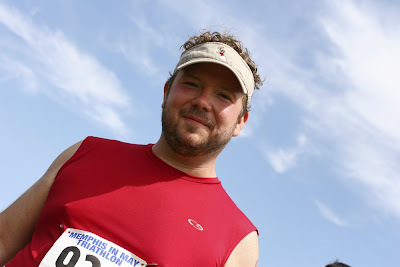 The wind was brutal on the day of the race. 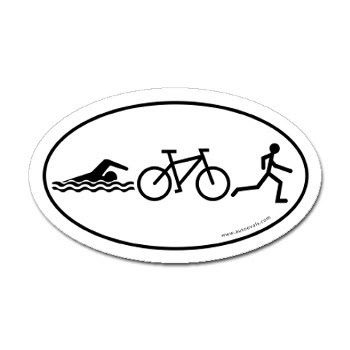 It blew me off course during the swim, and it made the bike very tough. I was so happy when I got to the run that I smiled the whole 6.4 miles. I could not have done it without my training partner Kelly, the support of my wife, and the encouragement of my family. Thanks y'all. Next up....a full marathon. 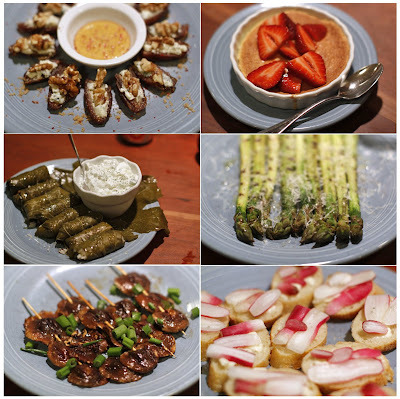 Last night was the first night of a weekly summer foodie get-together at my buddy Andria's house. The focus is local. Everyone brings a dish made with locally-sourced ingredients, and we all share. She is calling it "My Summer of Magical Eating." The Wife and I had a great time sharing a meal with the small group of writers, musicians, artists, filmmakers, and farmers Andria invited over for the evening. Can't wait to see what everyone makes next week. 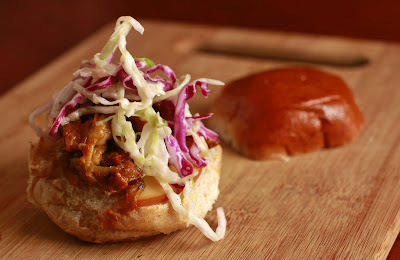 I made BBQ eggplant sliders, and they were wonderful (if I do say so myself!). The local part of my contribution was the honey slaw. The cabbage and onions came from two of my favorite farmers, Keith and Jill of Whitton Farms fame. The honey came from Peace Bee Farm, which is right across the bridge in Arkansas. Melt butter in a pot and add the onion. Cook over medium heat until onion is translucent. Add the garlic and the peppers and cook for a few minutes to marry the flavors. Add the remaining ingredients and stir. Cover and simmer for 20 minutes. Blend smooth with an emersion blender and return the pot to the stovetop. Simmer uncovered for an hour or until the mixture has reduced by 1/4. Will keep a week in your fridge -- or just freeze it. Preheat your oven to 375 degrees. Cut eggplants in half lengthwise. Generously oil a large rimmed baking sheet and place the eggplants cut-side-down on the sheet. Bake for 45 minutes. Remove eggplants and allow them to cool. Using your hands, pull the eggplant out of the skin allowing the stringiness of the vegetable to stay intact. Place eggplant flesh in a strainer and allow excess liquid to drain. 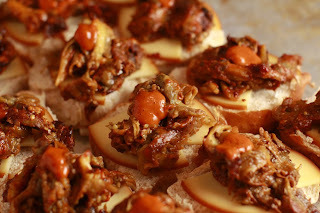 Arrange eggplant flesh in a single layer on your baking sheet and spoon on plenty of smoky bbq sauce. Return to the oven for 20 minutes until mixture appears dry and some caramelization has developed on the top. Mix all ingredients together in a large bowl. If you like it more sour, add more lemon. If you like it more sweet, add more honey. Assemble the sandwiches starting with two quarter slices of gouda placed on the bottom part of the roll. Spoon on some eggplant filling followed by some extra BBQ sauce. Top with honey slaw. Serve with some olive oil chips or some homemade sweet potato fries. Please note: I like to make most everything by hand, but this can be simplified for a weeknight meal by buying a bottle of good bbq sauce and some pre-chopped slaw. For The Wife's mom, who likes to drag a barstool from another room up to the the kitchen counter and sit and talk and watch the food being cooked, we figured tapas was the ticket. Now, we have never really made a meal like that before; it's rare that we even go out for an all small-plates meal. People, we are hungry -- constantly, painfully hungry -- and tiny bits of this and that usually does not sound too appealing. Well, we ended up making six different things, and they were great. 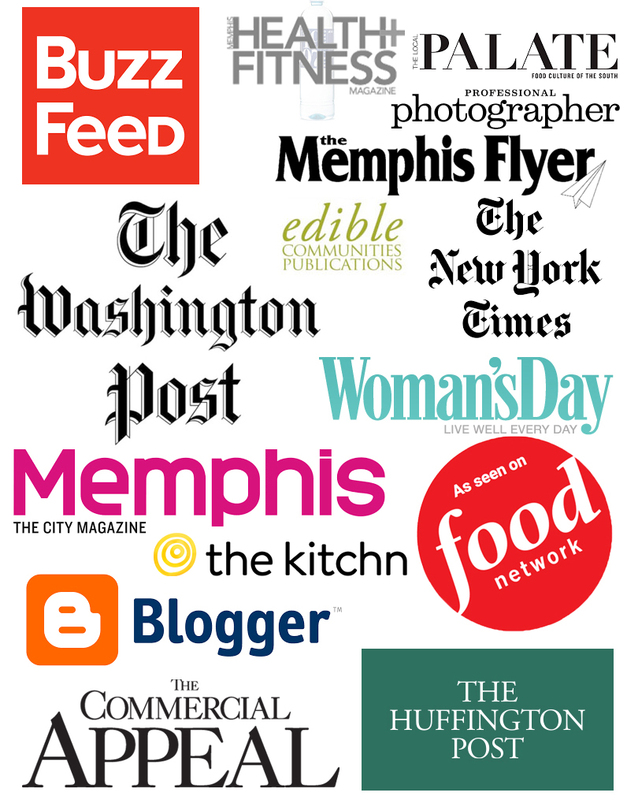 The starred dishes indicate Diane's favorites. Mix all liquid ingredients in a pitcher and add a handful of ice. Salt each glass by running a lime around the rim and dipping the edge of the glass into the salt. 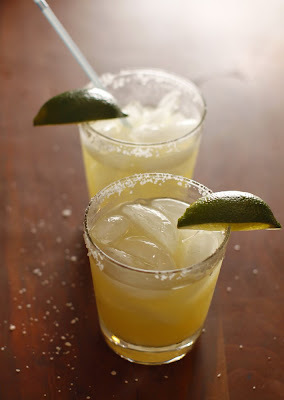 Add a few more ice cubes to each glass and pour the key-lime margarita mixture over the ice. Garnish with a lime. First make the masa dough. Dissolve the boullion cube in the water to make a broth. Whisk the shortening until it's fluffy. Mix the masa and the baking powder in a bowl, and then add the shortening and then the broth. 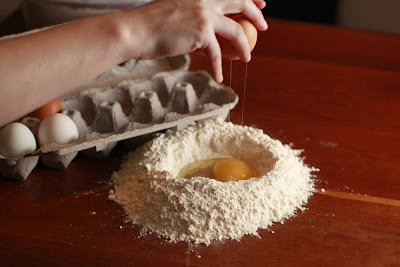 Mix until incorporated, but do not overwork the dough. Add the corn, onion, green pepper, and garlic to the masa dough, and work it in. Cut off and reserve the top off of each poblano pepper, wash, and pull out the ribs and seeds out of the top and body of the pepper. Spoon masa mixture into each pepper making sure not to leave any air bubbles. 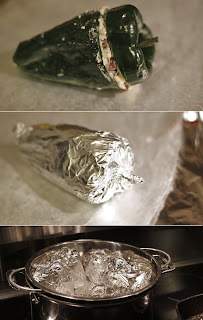 Wrap each pepper tightly in foil. Steam for 1 hour. This will cook the dough and soften the pepper. I use a large soup pot and a stainless steel colander as a makeshift steamer. It works perfectly. Allow the peppers to cool enough to handle, and then and only then, unwrap them. Arrange the peppers in a baking dish and drizzle them with olive oil. Place the dish into a 400-degree oven for about 10-15 minutes until the flesh of the pepper gets some color. 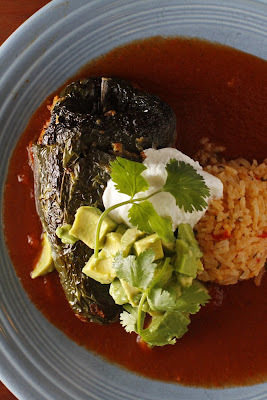 Serve with my enchilada sauce and rice. Top with some chopped avocado, cilantro, sour cream, and a squeeze of lime. It is hearty and delicious. It is simple to veganify it by simply leaving off the sour cream. We also had homemade key-lime margaritas and a wonderful flourless chocolate cake from the awesome book Baked. My sleep-deprived brain imagined it like a gussied-up version of cabbage and dumplings, a wonderful dish my friend Aaron's mom makes. 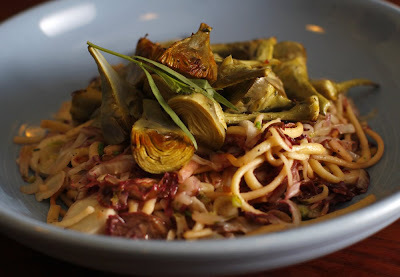 I set out to make spatzle with radicchio, endive, and tarragon topped with baby artichokes. It sounds good. It was terrible. S-O-U-R! 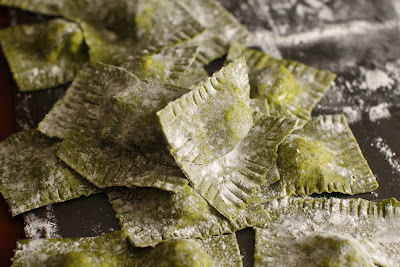 I always have a you-can't-win'em-all attitude in the kitchen, but this one broke a week-long winning streak that included some really delicious homemade ravioli. The cause of my lack of judgement in the kitchen can be traced back a few hours. My band played last night, and I only ended up getting a few hours of sleep. 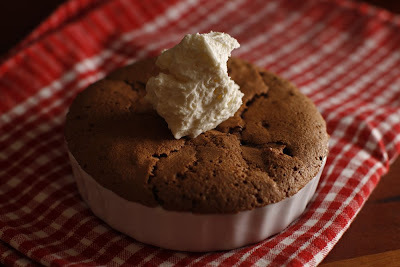 The Wife proposed making a great dessert as a way to redeem myself in the kitchen. She said that she had some key lime juice set aside while she was in the middle of chopping up some nearly stale French bread to freeze. I said, "Ooh, we could make key-lime bread pudding." Proving that my bad judgment was to surely continue, I decided to hang it up for the night. There are three meals tomorrow. Feeling unsatisfied by dinner I again wandered into the kitchen. 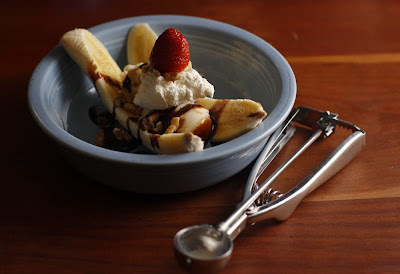 Redemption came in the form of a banana split with homemade whipped cream, walnuts, organic chocolate sauce, and a strawberry. Goodnight. 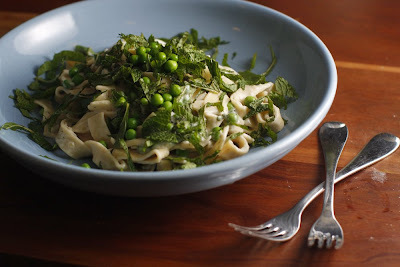 Two things set this dish apart from mint/pea pasta combos I have had in the past: I picked the mint from a patch in my own garden, and I used wide egg noodles instead of the typical fettuccine or spaghetti noodles. 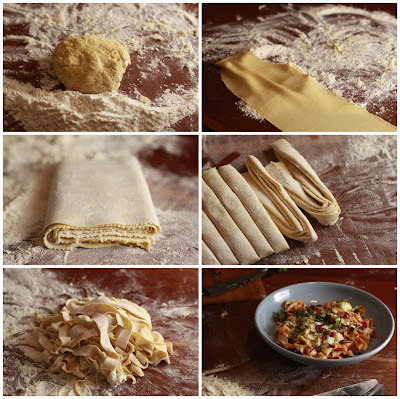 The egg noodles took on a dumpling-like quality making this simple pasta dish into a hearty meal all on its own. Put a large pot of water on to boil. In a large pan, melt butter over medium heat, and then add the shallot and garlic. Allow this mixture to cook for a few minutes until the butter stops bubbling. Careful not to burn the garlic. Add the flour, and whisk. Cook until the flour is pale brown. Add milk and whisk until thickened. Add the cream cheese, and whisk until smooth. Remove from heat. Cook pasta according to package instruction, and then add the pasta, peas, mint, and about 1/4 cup of the pasta water to the pan. Toss over medium heat to incorporate. 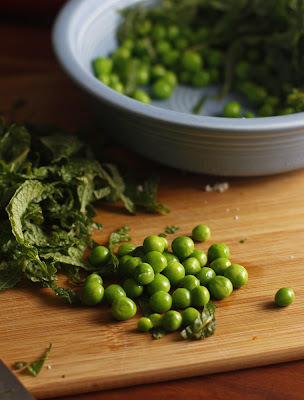 Garnish with a few more peas and some more fresh mint, add salt & pepper, and enjoy. 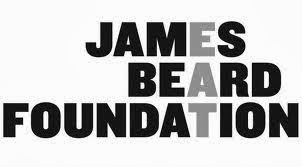 I play the drums in this band with my brother and our buddy David. You can check us out HERE, and then come see us play with Jason Freeman and Jeffery James + the Haul tomorrow night at the Bucc.